A conveyor system moves harvested blueberries to lugs. With rising costs and declining availability of harvesting labor, blueberry growers are increasingly interested in considering machine harvesting for their crops. Cost is a particularly important factor because of declining profit margins due to competition from lower-cost areas of production. Hand harvesting produces high-quality fruit, but can cost between $0.70/pound and $0.90/pound for local labor and $1.20/pound to $1.35/pound for H-2A labor in the southeastern United States. By comparison, machine harvesting is estimated to be approximately $0.30/pound, a significant cost savings. 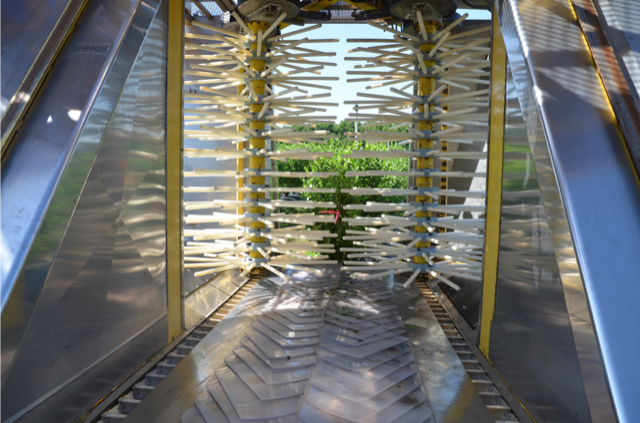 In addition to labor cost and availability issues, the use of mechanical harvesting can enhance food safety since the fruit is untouched by human hands during harvesting. Machine harvesting will likely become standard practice for many blueberry growers at some point in the near future.While machine harvesting can be financially advantageous, it also presents a number of challenges. The most important are related to a loss of yield potential, including ground losses of marketable fruit, detachment of immature berries, reduced berry firmness and quality, and an increase in the potential for postharvest decay. Ground losses occur when fruit is detached during the mechanical harvest but is missed by the catch plates at the base of the machine, which can be a source of significant loss in yield. The detachment of immature berries can result in both yield loss and additional sorting costs when packing the berries. Currently, the first harvest is typically delayed by five to seven days to concentrate fruit ripening on the bush to help minimize this problem, but delaying the harvest during a time when prices are the highest is not desirable. Fruit firmness can suffer during machine harvesting, mainly from bruising of the fruit when it drops onto the catch plate. Soft and leaking berries can be difficult to identify and remove during the grading process, and this fruit can lead to significant issues with maintaining quality during the post-harvest period. Also, bruising can result in a loss of wax on the surface of the berry, decreasing its visual appeal. 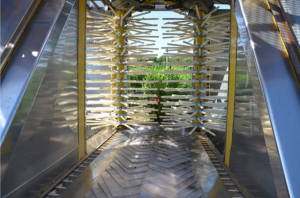 Finally, the extra handling during grading and sorting required with machine harvesting can reduce postharvest quality, primarily by increasing exposure of the berry stem scar to fungal spores and moisture on the packing lines. In one study, machine-harvested berries were 10 to 38 percent softer than fruit harvested by hand. After seven days of storage, there was 11 to 41 percent more postharvest decay. This is a significant issue since fresh-market fruit must maintain marketable quality for between two and three weeks following harvest. When investigating mechanical harvesting, producers must consider three important factors: genetics, cultural practices and technology. Genetics involves determining whether the right cultivar is being considered, with good machine harvesting characteristics that will minimize yield loss and maximize profits. For cultural practices, proper field design and the training of plant structure are important. In the technology area, new equipment has recently been developed, and new prototypes are currently being tested. Although the marketable yield results and strategies we have today are based on current technology, improvements in technology have the potential to allow machine harvesting of cultivars with lower fruit firmness while maintaining desired quality. Some of these traits have been a focus of the UF breeding program for many years, including firmer fruit, a small scar and a concentrated ripening period for the Florida market window. Cultivars previously released from the UF blueberry breeding program that have machine-harvesting potential include Farthing, Keecrisp, Meadowlark and Optimus. The adoption of new equipment technology may require certain changes to the best plant characteristics for machine harvesting. In addition to breeding for desired traits, improvements in cultural practices have been identified. This includes the use of trellises to reposition canes toward the outside of the canopy where fruit can be more easily detached, and installing crown-restricting tubing to help decrease ground loss. Some growers are also using cardboard milk cartons on young blueberry plantings to help train the plants to develop a narrower crown. An appropriate field layout for machine harvesting must also be considered, including sufficient room at the end of rows to turn the equipment around, and a plant layout that will not result in damaged plants. The use of forced air cooling immediately following harvest to dry and stabilize fruit. 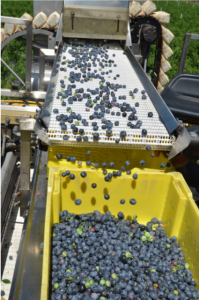 The combination of work by the UF blueberry breeding program, technological innovations in harvesting and packing equipment, and identification of effective cultural practices will facilitate more effective use of machine harvesting of southern highbush blueberry. This will result in significant cost savings potential, helping to maintain the competitiveness of Florida blueberry growers. Doug Phillips is a blueberry Extension coordinator with the University of Florida Institute of Food and Agricultural Sciences. This article was featured in the July issue of VSCNews magazine. 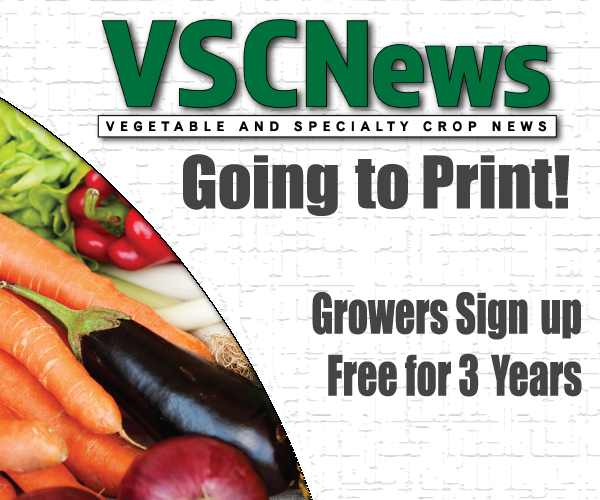 Click here to receive future issues of VSCNews magazine.